This unique technology gently spreads cool air through 21,000 micro air holes and creates “still air” moving at speeds slower than 0.15m/s. 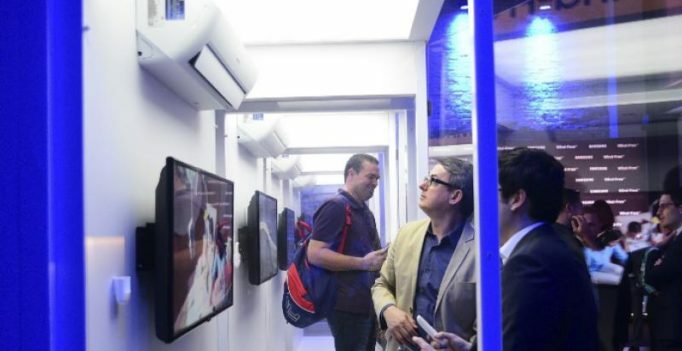 Samsung Electronics is poised to make a dramatic impact on the Latin American market with the AR9500M, its first wall-mounted Wind-Free air conditioner. Unveiled at Febrava 2017 – the International Trade Fair for Refrigeration, Air Conditioning and Air Heating (HVAC-R) – in Brazil on September 12, the AR9500M was awarded the exhibition’s Innovation Award (Selo Destaque Inovação). The product was first launched in Brazil, and features an innovative cooling system designed to simultaneously conserve energy and deliver comfort. Samsung’s AR9500M sets itself apart by producing no direct air drafts, keeping the room temperature comfortable thanks to Wind-Free technology. This unique technology gently spreads cool air through 21,000 micro air holes and creates “still air” moving at speeds slower than 0.15m/s. Wind-Free cooling technology introduces a two-step cooling process, reducing temperature in Fast Cooling Mode before switching to Wind-Free Mode, which maintains the desired temperature while minimizing drafts. In Wind-Free Mode, energy consumption is reduced by up to 72 per cent compared to Fast Cooling Mode. Furthermore, using the Samsung Digital Inverter 8-Pole with POWERboost Technology, the AR9500M takes less time to reach its desired speed. The AR9500M’s unique Triangle Architecture also contributes to its superior cooling performance. The upgraded structure’s wider inlet allows for more air to be drawn in at once, while the optimal width and angle of the outlet, extra v-blades and large fan – which is 22 per cent larger than in previous models – ensure that air is cooled and expelled faster, farther and wider to reach every corner of the room. The Wi-Fi enabled AR9500M allows temperature and product settings to be adjusted remotely via the Samsung Connect application. The application offers users real-time updates on performance and power consumption, and it can identify problems in need of repair. The AR9500M was introduced to industry professionals at Febrava 2017, alongside the 360 Cassette, the world’s first circular-designed air conditioner, and the Wind-Free 1Way Cassette for residential as well as commercial use. Taking place until September 15 at São Paulo’s Expo Exhibition and Convention Center, the trade fair is the most important event in the HVAC-R chain in Latin America, showcasing over 550 HVAC-R companies and attracting more than 30,000 visitors each year. Visitors to the Samsung booth can appreciate the comfort and quiet of Wind-Free technology for themselves at the company’s Wind-Free experience zone, which showcases its air conditioning technologies. Also on display are Samsung’s further cutting-edge HVAC-R solutions, including its corrosion resistance technology for long-lasting performance, with special protection optimized for the Latin American market. Brazil is a significant first step for Samsung towards capturing the Latin American market. The country represents the continent’s core market, with an air conditioner market share of over 25 per cent and a high demand for the comfort and efficiency offered by the premium air conditioner. Brazil’s Latin American neighbors will not be left wanting. Samsung has mapped out a further expansion into the region’s substantial market, equivalent to $2.4 billion dollars, in the latter half of 2017. There will be consecutive launches in new Latin American markets, when countries such as Peru, Argentina and Chile will be able to welcome Wind-Free technology and comfort into their lives.